Having a strong back is paramount to athletic performance and having a well-rounded physique. A strong and developed back gives the body that desirable V-shape. It creates the illusion of having a smaller waist and wide shoulders. How should you go about training your back? Depending on your current training split, choose 2-4 exercises per session and hammer out 2-4 intense sets per exercise. If you look at the movements I recommend, you’ll notice that most of them don’t require the use of machines or special equipment. A pull-up bar is actually all you’ll ever need to build a barn door back. Having said that, there’s no need to avoid weights or machines. Whatever works for you. One thing I will insist on, however – Hard work. The pull-up/ chin-up might be the king of all back exercises. Yet, it’s one of the least popular. Why? Because it’s difficult to do. Especially if you carry around excess bodyweight. Pull-ups will make you pay for every cheeseburger you’ve been eating. That’s why you see people doing the easier (and less effective) lat pull-down instead. If you can’t do pull or chin-ups at present, start out by using support (machine, bands or a partner). Another way to improve your pull-up performance is using negatives. Grab a pull-up bar and jump up (using your legs), bringing your chin above the bar and hold that position for a 2-second count. Lower yourself slowly. That’s one rep. Do sets of 5 until you can perform full pull/chin-ups. Work on your form with consistency and you’ll be able to bang out pull-ups in no time. If you can do 15+ reps for multiple sets, you should start adding weight to the exercise. By the time you’re able to perform weighted pull-ups your back will be on another level. If you read my article on How to Train for Maximum Muscle Growth, you know that my favorite back exercise is the horizontal pull. I call them horror pulls. Why the name? Do 5 sets of 20 reps and you’ll know exactly why. They hit the muscles of the back (and arms) hard and ignite a muscular burn that will have you screaming for mommy. Doing high rep sets of horror pulls has built my back unlike anything else. You can do them using a barbell, gymnastic rings or a sling trainer. Simply place the barbell at hip height (or higher) in a fixed position (e.g. squat rack or smith machine) and get to work. High reps (12+) are where the money is with this exercise. Bent-over rows are fantastic for increasing muscle size and strength. They can be performed using dumbbells or a barbell. Go fairly heavy here (6-10 reps). You can experiment with higher reps on occasion, but this is a great exercise for building power and raw strength. Well this one was quite obvious, wasn’t it? Every internet expert will tell you that deadlifts are part of a nutritious breakfast (wait what?). Me personally? I’m not a big fan, to be honest. They’re good for increasing overall strength but not everyone will benefit from “deads” to the same extent. Try them and see for yourself. If you’re new to weight training, start out slow to reduce the risk of injury. Gradually work your way up to heavy loads and do sets of 8-12. Stick to low reps 3-5 if your focus is on power. The front lever is an advanced movement, often viewed as an abdominal or “core” exercise. While it does strengthen the core very effectively, it works the lats (latissimus dorsi) even harder. Start by doing leg raises if the front lever is too challenging. Then try performing the front lever with your knees tucked in. 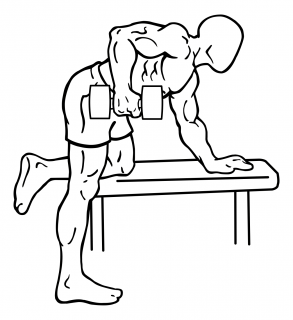 Over time, provided you stick with it, you will be able to do front levers for reps. Work your way up to sets of 10. Bridges are another fine addition to any back routine. This somewhat exotic exercise hits the entire posterior chain of your body. The lower back and the hamstrings take the majority of the beating, however. This is another movement cut out for high rep sets. If you feel it’s too easy for you, lift one of your legs off the floor. And there you have it. A fine selection of exercises that could put muscle on a stick. Try them and get back to me with your results. Until then. Stellst auch mal längere Videos zum mittrainieren rein? Da bekommt man echt Lust auf mehr! !